Mistletoe might be a nice yuletide decoration, but it’s also a nefarious, parasitic badass that preys upon a series of hosts. Apparently one species has decided it no longer needs a protein that every other multicellular organism on Earth requires to live. European mistletoe seems to survive without a protein indispensable for life called “complex I,” two independent teams of researchers reported yesterday. It’s the first multicellular living thing to known to survive without this protein. “It’s been shown in yeast and some human parasites, but it’s quite puzzling to see that in such a large organism,” Etienne Meyer from the Max Planck Institute of Molecular Plant Physiology in Germany told Gizmodo. Those yeast and parasites, though, are single-celled, and mistletoe is very much not. You may have heard the cliché “mitochondria are the powerhouse of the cell.” Mitochondria produce the energy-storing adenosine triphosphate, or ATP molecule, in several different ways, one of which requires a series of electron-rearranging protein complexes. Complex I is the first of those protein complexes. The two groups of scientists first heard about the hypothesis of the missing protein complex at a conference and then embarked on a friendly competition to go looking for it in the European mistletoe mitochondrial DNA. Neither could find it, according to the two papers published today in Current Biology. One of the groups found that the rest of the complexes seemed to rearrange in a way that compensated for the missing complex I. The plant still had markedly lower levels of ATP in its mitochondria, though perhaps it was making ATP somewhere else, like in its photosynthesising chloroplasts or the cytoplasm—or using resources from its host. 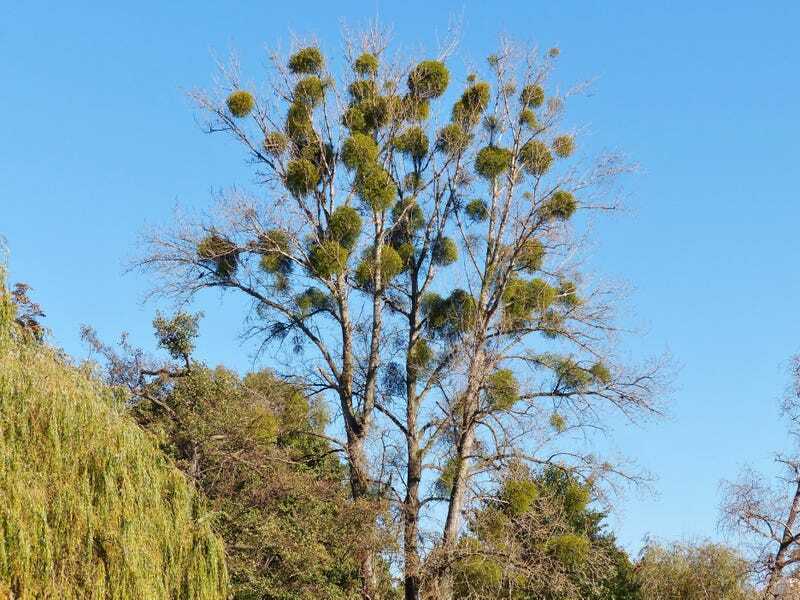 After all, the researchers told Gizmodo that the missing protein complex is definitely related to the parasitic lifestyle of European mistletoe—partially because it still photosynthesises. It seems that, in being a parasite, the plant no longer found it necessary to keep making this big protein required for its cellular respiration process. It’s still early days, though, so how the plants compensate for the loss, as well as which came first—losing the protein or becoming a parasitic plant—is unclear. “There’s speculation to how this could work, but there’s still more to be done,” Hans-Peter Braun from Leibniz University of Hannover in Germany told Gizmodo. This is a first look at a strange process, and the scientists we spoke to are interested in what this might mean for other multicellular parasitic plants as well. Kelsey Yule from the University of Arizona speculated in an email to Gizmodo that perhaps one day these plants could stop photosynthesising altogether. So next Christmas, before you lean in for a kiss beneath the mistletoe, stop and think about how weird evolution can really be.